Problem: An older street rod engine has rust in the antifreeze. The antifreeze looks very brown, and the water pump was replaced because of bad bearings. The person who built the street rod did not put an overflow tank on the cooling system. What could be the problem? Solution: Rust in the cooling system and antifreeze is normally caused by air getting into the radiator when the engine cools down. As the coolant cools, it shrinks or contracts in volume. An overflow tank (see arrow on photo) normally has sufficient coolant in it to keep the radiator full even at cold temperatures. Without an overflow tank, as the coolant contracts, air will enter the cooling system through the radiator cap when it cools down. The air mixed with the metal in the cooling system will cause rust to develop. The rust in the coolant causes wear on the water pump seal and the water pump bearings. The best solution is to purchase an overflow tank and install it on the cooling system. Keep the overflow tank filled to the mark shown on the tank. If there is rust in the cooling system it is best to flush the system out and replace the old coolant with new antifreeze and water. 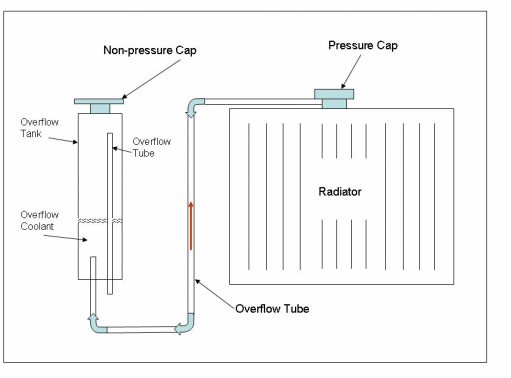 To see how the overflow tank works, refer to the drawing on the left. When the engine coolant heats up in the radiator, the coolant expands. This causes the pressure in the cooling system to increase. When the pressure goes above the pressure cap setting, coolant passes through the pressure cap seal, through the overflow tube, and into the overflow tank. See blue arrows.